Located west of the Chicago River, adjacent to the the Loop, the Near West Side is also one of the four areas that constitute downtown Chicago. The others being the Near North Side, Near South Side, and the Loop. Compared to Chicago’s other downtown areas, the Near West Side has the largest total area, second highest population, and third highest skyscraper count. The rich history of the Near West Side of Chicago includes founding of Hull House, a prominent settlement house. The Great Chicago Fire started in the Near West Side. 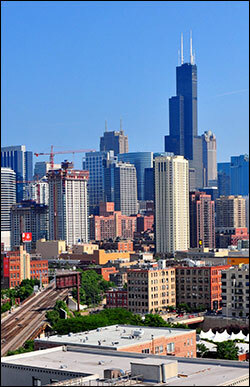 The area is also home to the University of Illinois at Chicago (UIC), the United Center and the several major hospitals. The Fulton River District makes up the north east area of the Near West Side, just west of the Loop. It is bordered by the Chicago River to the east, Ohio Street on the north, Madison Street to the south, and the Kennedy Expressway to the west. The Fulton River District is a former manufacturing and current transportation corridor turned residential neighborhood. The neighborhood is made up of warehouses that have been converted to loft condominiums, new construction high rise condominiums and apartments, high rise and mid rise business offices, retail and restaurants. The Fulton River District is also the home of The Boeing Company, and the Ogilvie Transportation Center (formerly Chicago & North Western Station), a major commuter rail terminal. The neighborhood is known for the scent of chocolate emanating from the Blommer Chocolate Company. Greek Town is a restaurant and nightlife corridor along Halsted Street between Van Buren and Madison Streets. It was popularized in the movie “My Big Fat Greek Wedding,” which was actually filmed mostly in Toronto. Formerly part of a larger Greek neighborhood called ‘The Delta’. The neighborhood between the Illinois Medical District and UIC’s east campus is known alternately as Little Italy or University Village. An Italian community developed in the late nineteenth century. Italians never actually constituted a majority in the polyglot area, but the neighborhood is still home to several Italian-American landmarks, such as the Shrine of Our Lady of Pompei and the National Italian American Sports Hall of Fame, as well as Italian-American social clubs. Taylor Street is home to the Italian restaurants Rosebud, Francesca’s, Pompei and Al’s No. 1 Italian Beef. Part of the Italian-American population of the neighborhood was displaced in the 1960s and 70s by the construction of UIC’s east campus. The university is the source of the newer name for the area. The blocks around the intersection of Maxwell and Halsted Streets once served as a weekly outdoor market. The area was also a center in the development of the Chicago Blues in the mid-twentieth century. The Market was moved twice in the 1990s and 2000s, and continues on Des Plaines Street. In the 2000s, UIC led a redevelopment of the area, which included new dormitories, parking garages, commercial buildings, and housing. The Illinois Medical District is one of the largest medical districts in the United States, and the largest in the state. John H. Stroger Jr. Hospital of Cook County (formerly known as Cook County Hospital), one of the largest county-run hospitals in the U.S. and inspiration for the TV shows ER and The Fugitive, is located here. The District had its start in the 1870s when Cook County Hospital, Rush Medical College, and the College of Physicians and Surgeons were established on the Near West Side following the great Chicago fire of 1871. The cornerstone for the Medical Center was the building of Cook County Hospital in 1876. In 1877, Rush Medical College erected a building next to County at Harrison and Wood. Presbyterian Hospital (affiliated with Rush) was built in 1883. The University of Illinois at Chicago’s origins in the District can be traced to the College of Physicians and Surgeons, founded in 1881. In 1917, the State acquired the vacated West Side Park located at Polk and Wolcott for the University. The district is also home to University of Illinois Medical Center, Rush University Medical Center, Rush University, University of Illinois College of Medicine, UIC Eye & Ear Infirmary, UIC College of Dentistry, UIC College of Pharmacy, Jesse Brown VA, The Neuropsychiatric Institute, Rothstein CORE Center, Chicago Lighthouse for the Blind & Visually Impaired, Illinois Forensic Science Center, West Side CDC, the Chicago Children’s Advocacy Center, Chicago Dept. of Public Health and the Cook County Coroner’s Office. Tri-Taylor, the western end of Taylor Street’s Little Italy, consists of the roughly triangular area bordered by Congress Parkway to the North, Ogden Avenue to the East, Roosevelt Road on the south and railroad tracks on the west. The neighborhood is traditionally an extension of the Little Italy neighborhood to its east, although it has consistently been one of the most diverse neighborhoods in Chicago as it was situated on the borders of African American, Irish, Hispanic, and Italian areas. It is a residential area for students from UIC. The neighborhood is also home to the Chicago Technology Park research center as well as the West Side Center for Disease Control, the office for the Medical Examiner of Cook County, and Chicago Hope Academy (a private Christian high school that opened in the former St. Callistus School in 2005). The United Center opened its doors in 1994, replacing Chicago Stadium, which was located across Madison St. The United Center is the home arena for the Chicago Bulls and Blackhawks, and also occasionally hosts concerts and other special events. The venue can seat between 20,000 to 25,000 people, depending on the event. A statue of Michael Jordan sits in front of the arena. A former manufacturing and warehousing area, many of the buildings have been converted to loft condominiums, restaurants, night clubs, art galleries. It is also the home of Harpo Studios, owned by well known talk show host Oprah Winfrey, and the production site of her syndicated television show. Interastates 290 and 90 both run through the Near West Side. Their interchange is a major transportation hub for the region. The southern and western boundaries of the area are defined by busy rail-road tracks. The St. Charles Air Line, at the area’s southern edge is also a major passenger train route. The area is served by the Blue, Green, Pink ‘L’ lines, as well as many CTA bus routes. Union and Ogilvie station, major terminuses for Metra and Amtrak trains.